Avery Press (Penguin Random House), New York (in press, release date Sept. 12, 2017). Happiness, our first garden, is our natural birthright, but we’ve been cheated out of it. In its place has been substituted a garden of earthly delights, and we’re all the worse for it. Some pay the ultimate price and slip into the abyss of eternal damnation. But that first garden is right in front of you, just behind the curtain of your own brain. You can reenter anytime you choose. I’ve chosen. I suggest you choose now. It’s time to reclaim your original garden as your own. Hudson Street Press (Penguin USA), New York. New York Times Best Seller. Translated into Mandarin, Japanese, Korean, German, French, Dutch, Polish, Norwegian, Swedish, Czech, Slovenian. Ascribing personal responsibility to the obese individual is not a rational argument for an eminently practical reason: it fails to advance any efforts to change it. The obesity pandemic is due to our altered biochemistry, which is a result of our altered environment. Hudson Street Press (Penguin Random House), New York. 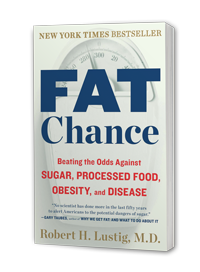 Fat Chance became an instant New York Times bestseller. 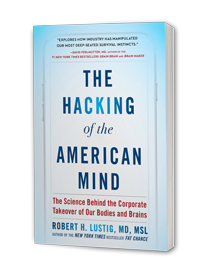 Robert Lustig’s message that the increased sugar in our diets has led to the pandemic of chronic disease over the last thirty years captured our national attention. Now, in The Fat Chance Cookbook, Lustig helps us put this information into action for ourselves. With more than 100 recipes as well as meal plans, nutritional analyses, shopping lists, and food swaps, he shows us easy ways to drastically reduce sugar and increase fiber to lose weight and regain health – both for ourselves and for our families. Lustig also shows us how to navigate the grocery store with handy lists for stocking the pantry as well as how to read a food label in order to find hidden sugars and evaluate fiber content. 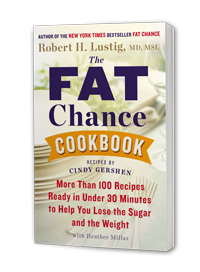 Accessible, affordable, and geared toward lasting results, The Fat Chance Cookbook will be a fun and easy roadmap to better health for the whole family. E-book, Hudson Street Press (Penguin Random House), New York. In the newest edition of The Dietary Guidelines for Americans, the U.S. government has – for the very first time – limited the amount of sugar that it is safe for us to consume. Yet sugar hides behind many names on ingredient lists, making it sometimes impossible to discover. 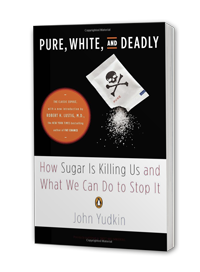 Although “evaporated cane juice” might be easy enough to puzzle out – what about “diastatic malt” or “panocha?” In Sugar Has 56 Names, Robert H. Lustig, MD, bestselling author of Fat Chance and The Fat Chance Cookbook, provides a list of ingredient names that food manufacturers use to disguise sugar content as well as a rundown of common grocery store items and their total sugar content. 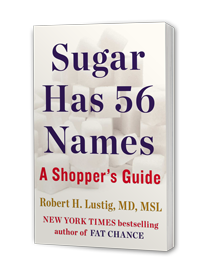 Concise and direct, Sugar Has 56 Names is an essential tool for smart shopping. Obesity obeys the First Law of Thermodynamics. The routine assumption is that obesity is the result of a mismatch between calories in and calories out; in other words, the result of two divergent behaviors. However, there is mounting evidence that biochemical forces can drive obligate weight gain, and that the observed behaviors of increased energy intake and decreased energy expenditure are secondary to these processes. Furthermore, many of these biochemical forces are determined in utero; resulting in a developmental drive toward obesity and disease in later life. Four distinct prenatal forces have thus far been identified: 1) genetics; 2) epigenetics; 3) developmental programming; and 4) environmental obesogens. This volume explores the evidence for each of these in detail in human and animal models, and attempts to provide a cohesive analysis of the biochemical bases of obesity. This volume will appeal to geneticists, developmental biologists, endocrinologists, epidemiologists, toxicologists, obstetrician/gynecologists, nutritionists, veterinary scientists, animal husbandry researchers, domestic species researchers, and obesity researchers and practitioners. “This very timely volume provides an in-depth scholarly overview of a critical challenge facing our society—the obesity epidemic. 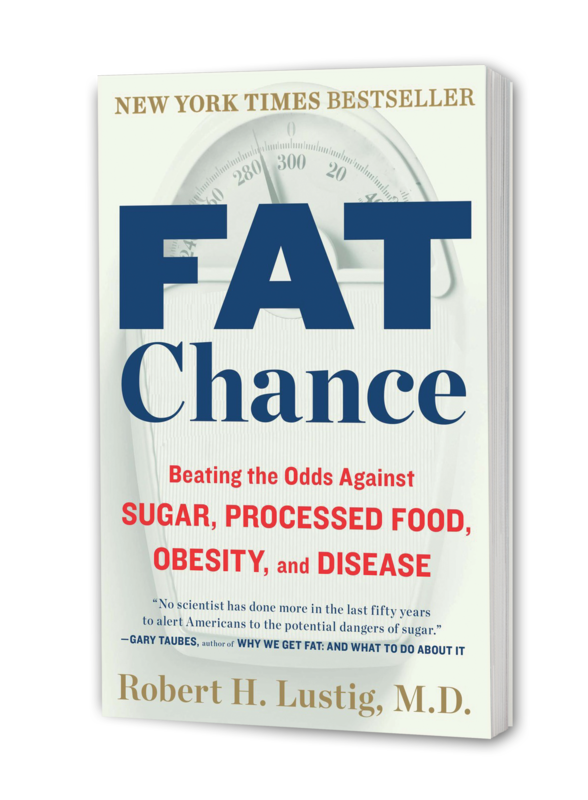 Dr. Robert H. Lustig has assembled expert authors to address the fundamental contribution of preprogrammed genetic disorders leading to obesity, as well as the role of very early environmental influences. 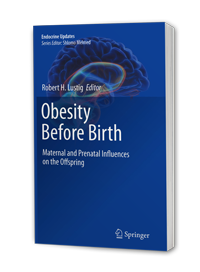 The chapters range from classic genetic mechanistic understanding through intra-uterine epigenetic influences, factors determining developmental programming, and the new clinical science of perinatal obesogens. Obesity Before Birth: Maternal and prenatal influences on the offspring, brings easily accessible, cutting edge information to geneticists, pediatricians, endocrinologists, as well as those clinicians and scientists pursuing the complex yet elusive causes of childhood obesity and related disorders. Robert Lustig provides the introduction: “Prophecy and Propaganda”. Penguin Books UK, London, 2012, pp. vii-x.